This flirty wrap features an unusual construction method: the "edging" is actually knit first. Fifteen picot-edged half-circles are knit separately in garter stitch, then stitches are picked up to join them to begin the garter stitch base of the shawl. This is a spectacularly fun and festive use of color work and lace in a knit shawl. You can make this gorgeous shawl with a single ball of Be SO Fine Yarn, or use a Trio of Tidbits to make it in three colors for extra fun! This bottom up construction, half-circle shawl is fringed with beautiful crescent motifs and works up quiclky with easy lace. 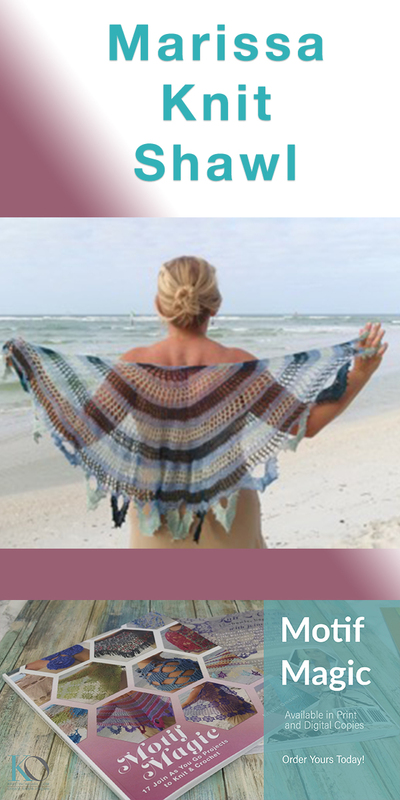 Below you will find a link to a 4-part video tutorial for this beautiful shawl on Kristin's YouTube Channel and a new Pinterest contest, too! The Marissa Knit Shawl is featured in Kristin Omdahl's newest book, "Motif Magic: 17 Join As You Go Projects to Knit and Crochet". To get a flavor for the entire book, please enjoy this video tutorial. Enter to win a copy of Motif Magic, or order your own personalized, autographed copy today! Click here to order an autographed, personalized copy of Motif Magic directly from Kristin Omdahl.